The North Park Care Center facility is comfortably designed for Skilled Nursing Care. Medicare approved, the 25 bed facility offers 24 hour professional staffing. The health care team, including Registered Nurses, Licensed Practical Nurses and Nursing Assistants provide exemplary care under the direction of a licensed nursing home administrator. A physician is always on call. North Park Care Center is designed with the resident in mind. Accommodations include private suites, high-speed Internet, flat-screen TVs, walk-in showers, and extra-wide hallways. An award winning dietary staff with food prepared by a chef provides three meals a day, every day. . . and an evening snack. Since leisure time represents a significant portion of life at North Park Care Center, activities such as sing-a-longs, coffee groups, fitness classes, arts and crafts, library services, pets and children’s visits, family nights and other social functions are staff developed. Our object is… to add years of life and life to years! 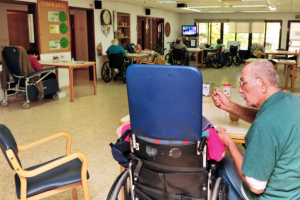 A better quality of life by living as independently as possible is the goal of the Rehabilitation Department. The Care Center provides a comprehensive program in a 3,000-square-foot therapy gym for physical, occupational and speech therapy, also includes outpatient therapy. Choosing a long-term health care center is often a new and difficult experience for the prospective resident and family. Full pre-admission counseling and family support counseling is offered. We have spent over 50 years caring for people and their families. Our Care Centers provide an excellent and comprehensive therapy program. 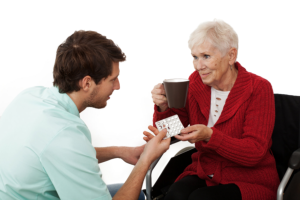 We offer the complete range of Rehabilitation and Restorative Nursing Services. Our Therapy Department is staffed with Licensed Physical, Occupational and Speech Therapists and their assistants. The Therapists evaluate rehab candidates, and create an individualized treatment plan for each resident. A Restorative Nurse and Restorative STNA’s coordinate the restorative-nursing program with the Therapy Department. The goal of our Therapy Departments is to assist each person to reach their maximum functional potential and to regain optimal independence.